REST ASSURED. WE HAVE TAKEN CARE OF ALL THE DETAILS, SO ALL THAT YOU HAVE TO DO IS TO GET A RESTFUL NIGHT'S SLEEP. Caliber owners are serious sailors. And part of serious sailing is having a serious anchoring system. We know that security on the hook, results in securing a good nights sleep. You can rest assured with the Caliber Smart Anchoring System™. From the specially designed anchor rollers, to the specially designed anchor rode lockers, we have taken care of it all. Caliber Smart Anchoring System™ will provide you with everything you need to stay securely in place even during the worst storm conditions. Specially designed UHMW* rollers to prevent rode jumping. Rollers are mounted on heavy duty stainless brackets with chafe protection beading welded along the edges. Note the stainless security bails to help keep the stowed anchors securely in place. Heavy-duty all stainless dual anchor platform with replaceable polymer scratch preventers. Designed for ease of launching and retrieving serious sized anchors used by serious cruising sailors. 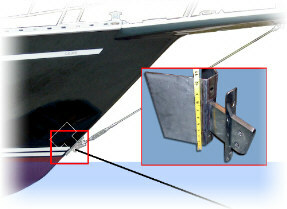 An extended platform keeps the anchor off the deck and away from accidentally impacting the hull. Custom designed and custom manufactured stainless steel mooring/anchoring chocks. That will keep anchor rode in place even during storm conditions with a heavily pitching bow. * Large specially designed UHMW** rollers prevent rode from jumping and chafing. Super secure anti-chafe attachment point. Can be used as an emergency towing point. Or sea anchor attachment point as well as a storm anchor attachment point that is 100% chafe free. Securing low on centerline also keeps anchor tacking to a minimum.